In the 1980s and 1990s parts of Africa saw a surge in dam building for energy production. After a brief hiatus there has been renewed interested. Many new construction projects are planned and underway across sub-Saharan Africa. An energy initiative, the Programme for Infrastructure Development in Africa, that has the buy in of all African countries, argues for major hydropower developments within a broader clean power agenda. The initiative argues that this would enable African countries to keep pace with rising demand for electricity. It estimates that total generating capacity, which is presently 125 GW, will need to increase by 6% per year to 2040. 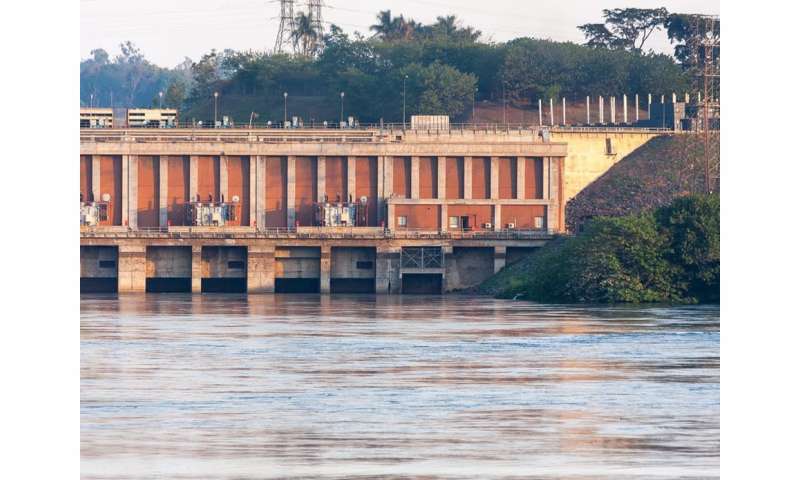 The large hydropower dams planned for southern and eastern Africa for construction by 2030 could double the current installed capacity for hydropower taking it from 17 000 MW to 49 000 MW. They include a number of new developments, such as the Grand Ethiopian Renaissance Dam on the Blue Nile. The Renaissance Dam on its own will have an installed generating capacity of 6000MW. This is similar in size to the world's largest nuclear power station, Japan's Kashiwazaki-Kariwa plant. The dam will generate just under a quarter of the power generated by the world's largest hydropower station, the Three Gorges Dam. The new dams in Africa have the potential to meet increased electricity demand. But our research into the links between climate and the water, energy and food nexus in Africa shows that in the longer term the locations of the new planned dams could put the security of electricity supply at risk for large parts of southern and eastern Africa. This is because the majority of planned dams are in the same river basins and will rely on similar patterns of rainfall and hence be vulnerable at the same time to drought and dry years. This will create a vulnerability because a lack of rain and droughts could lead to electricity supply being disrupted. This is why it's important to factor climate variability and change into dam design and management, and to diversify the electricity production to avoid over reliance on hydropower. Hydropower relies on the flow of water to drive turbines for electricity generation. It uses natural changes in elevation or artificial storage in reservoirs to take advantage of the water level difference. Drought or successive dry years can result in not having enough water to drive electricity generating turbines and a shortage of electricity. In countries like the US and in parts of western Europe hydropower is complimented by other power sources. This means that in times of drought other sources of power can balance the shortfall. But in countries where the energy mix is dominated by hydropower – as in sub-Saharan African countries, Norway, and Brazil – climate variability is much more of a problem. Without alternative power sources, fluctuations in hydropower can disrupt electricity supply. And supply might need to be turned off either to ration dwindling water resources or because demand simply can't be met. Our study shows that if all the planned large dams are built, 70% of total hydropower generating capacity in eastern Africa will depend on rain within the same rainfall clusters by 2030. In southern Africa, 59% of hydropower generation will depend on a single area of similar rainfall variability. Rainfall clusters represent large areas that experience similar rainfall patterns. Sometimes this happens because they are influenced by climate phenomena like El-Niño events, where ocean and atmospheric shifts in the Pacific Ocean influence weather and climate across the tropics. This includes much of eastern and southern Africa. For example, the Nile and Zambezi, where multiple dams are planned on the same river channels, lie in the same rainfall clusters. This means that dry years will affect storage in all the dams. This will lessen their ability to refill fully. This could create a significant challenge for the supply of hydropower. There are already examples of this happening. In December 2017 Malawi's state owned electricity company saw power output plummeting after a severe drought. Malawi relies almost entirely on hydropower. And during the 2015–16 El Niño event, Malawi, Tanzania, Zambia and Zimbabwe all experienced electricity outages due in part to reduced rainfall. Infrastructure around the world is being put to the test as a result of new combinations of intensity and duration of extreme weather associated with climate change. It's therefore critical that the resilience of infrastructure is tested. This is particularly true when it comes to river flow in many of Africa's river basins because they are highly sensitive to changes in rainfall. Although climate model projections of future rainfall still include wetting and drying throughout Africa, studies of the impact on hydropower generally show high sensitivities. These new findings, together with the increasing importance of hydropower and the potential for increasing levels of rainfall variability under climate change, underscore the need to incorporate climate risks into infrastructure planning in Africa. Could they use some of the early income from their hydro-power to buy wind-farms and solar panels, to be sure, to be sure ? ?